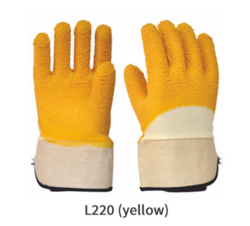 Manufacturer of a wide range of products which include cotton supported cut and sewn moire finish latex coating glove, cotton supported latex coated gloves and cotton supported cut and sewn moire finish latex coating gloves. 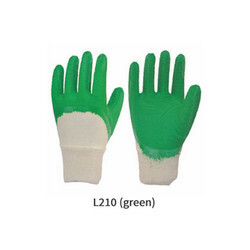 These gloves are made from 100% Cotton Liner Interlock or Jersey (Cut & Sewn) for comfort, natural hand shape for ultimate fit & long wear without fatigue combined with unique thick crinkle coating of Latex which enhances the safety & grip. Cotton liner absorbs perspiration. Two piece liner without seams eliminates hand irritation. Open back (Uncoated) allows circulation of air. Knit wrist prevents entry of debris. Also available in an option of Safety Cuff. These gloves are shaped anatomically shaped enabling the user the extended wear while reducing the hand fatigue. It also offers good cut, abrasion & puncture resistance. Highly suitable for handling sharp or rough objects. 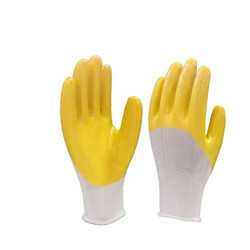 Looking for “Latex Dipped Gloves”?